After tagging your deer, and calling for your transportation number, take your deer to one of the participating butchers listed on our website, and in the hunter’s digest. The food bank is not allowed to distribute the meat unless the deer is processed at a butcher that has been inspected by the State Health Dept. All participating butchers have passed this inspection. Rick EpsteinTrustees of Hunters Helping the Hungry and their liaisons are (from left) NORWESCAP liaison Shannon Williams; trustees Bud Thomas and Mark Charbonneau; state Fish & Wildlife liaison Larry Herrighty; and trustees John Person, Les Giese, Pola Galie and Joe Schultz. New Jersey has lots of hungry people and it also has lots of white-tailed deer — especially in Hunterdon County. That’s the equation that has added up to a million meals provided by Hunters Helping the Hungry since the group was founded in 1997 by two Clinton Township men. A meal is figured at a quarter-pound of venison. HHH consists of six trustees — founders Lester Giese and Joe Schultz; Mark Charbonneau and John Person, also of Clinton Township; and Pola Galie and Bud Thomas, both of South Jersey. The trustees spread the word to hunters on how they can donate their kills to the needy, raise money to pay game butchers, and make arrangements with NORWESCAP and Catholic Charities for distribution of the frozen meat all over the state. Person, who is one of eight butchers who process the meat at a discounted price ($65 per deer instead of the usual $94), praised the hunters who donate. “They make a commitment,” he said. Charbonneau explains, “The second you pull the trigger, the work starts.” That involves gutting the deer, carrying the carcass out of the woods, bringing it to a checking station and then to a participating butcher, plus paying $10 toward the processing. “It’s a beautiful thing,” he says. Not surprisingly, animal-rights activists claim the program’s real purpose is to put a charitable face on a cruel sport. Charbonneau would tell them they’re thinking too hard. It’s about feeding the hungry. Meanwhile HHH is busy matching venison with hunger. A TV segment on the nonprofit was shot recently for the “Friends of the NRA” show, which will be aired on the Outdoor Channel in January. Charbonneau says after a visit to Person’s butcher shop, “we went to Catholic Charities in Phillipsburg where a particular family stood by.” The couple had four kids, the wife had lost her job and the husband’s work hours had been cut and they were grateful for the food. He had never seen this end of the HHH process and “at that time my voice cracked,” he says. © 2011 NJ.com. All rights reserved. The 2012 Garden State Outdoor Sportsmen’s Show featuring the New Jersey Division of Fish and Wildlife’s Garden State Deer Classic is slated for January 12 – 15 at the New Jersey Convention and Exposition Center in Edison, NJ and promises to be the best ever. Continuing on the success of last year’s program, the newly refurbished Deer Classic and Division of Fish and Wildlife display will be a focal point for the show. This year the Show is pleased to provide two very good reasons to purchase an admission ticket online at http://gsoss.ticketleap.com/garden-state-outdoor-sportsmens-show/t/HHH12/. Online ticket purchasers are being offered a 1 year subscription to a choice of Field & Stream, Caribbean Travel & Life, Outdoor Life or Popular Science magazine and for every ticket sold online, the Show is donating $1.00 to New Jersey’s Hunters Helping the Hungry (HHH). For additional information on the Show please visit http://www.gsoss.com/. Purchase tickets online at http://gsoss.ticketleap.com/garden-state-outdoor-sportsmens-show/t/HHH12/ . Check out this video from the May 2011 Sporting Clays Shoot. We hope that you will join us this year for another great shoot. You can check out the details here! START SAVING on your Electric Bill today by switching to Viridian Energy!!! You will save approximately 10% on your electric bill and Viridian will pay $2 per month / per meter to Hunters Helping the Hungry. It’s a WIN/WIN opportunity! Your monthly bill and all service issues will still come from your current electric company. It’s FREE to switch, FREE to cancel at any time AND IT’S A GREEN PRODUCT which helps the environment! Sign up today! You can sign up by telephone (residential or commercial accounts) or on-line (residential only). Either way have your current electric bill handy. By making the change in to Viridian in December, 2010 you’ll receive an additional 10% off your first bill with Viridian and HHH will receive an extra boost too. Please don’t let this note get lost on “the pile” do it now! 1. On-Line: go to www.viridian.com/HHH. Make sure you put in the “/HHH” 2. Click on the green leaf in the right hand corner that says “Become a customer” 3. Follow the 3 steps • Step 1 – Have your electric bill handy and go to Utilities and Service Rates and type in your zip code. Then select your utility company, select account class (residential), select rate plan (Everyday Green or Pure Green) and click Proceed. • Step 2 – Type in your name, address, Customer Number (this in NOT your account number), etc as shown on your electric bill and click Proceed. • Step 3 – Type in telephone, E-mail and E-signature and hit Submit. By Telephone: call Viridian at (866)-663-2508 to sign up. Please advise Viridian that you are with Hunters Helping the Hungry (Associate ID number 10963). Contact Debbie with any questions at cmmc2@FindSolutionsOnline.com or 908-735-4438 x 101. Thank you for your support. New Jersey’s own Hunters Helping the Hungry organization will be one of the groups featured on an upcoming CNN one-hour special entitled Giving in Focus: 12 Days of Goodness. Hunters Helping the Hungry are in desperate need for funds!! Only 6 weeks into the current deer hunting seasons; HHH has already processed over 8,200 pounds of venison! For the entire deer season in September, 2009 through February 2010; HHH processed only 15,000 pounds. We are running out of money to pay the butchers. Hungry families served by over 400 food pantries, kitchens, church organization and other generous organizations want venison. Venison is low fat and low cholesterol and, of course, high in protein which makes venison a very valuable food product and healthy alternative for distribution in the food bank system. Hunters participate in the program by donating deer through an approved butcher to the NORWESCAP (Phillipsburg, NJ) or Ocean-Monmouth Food Banks or Food Bank of South Jersey. Processing fees are paid to the butcher by HHH from a fund consisting of donations and grants. Approved butchers are inspected by the State of New Jersey Health Department. Hunters not only spend time hunting and money for licenses and permits, but they also donate $10 to $65 of the professional meat processing fee when they drop a deer off for processing. HHH is a non-profit 501-c3 organization. A small group of volunteers sit on the board of HHH and receive no compensation for their efforts. All administrative duties are supplied by the volunteer board members. Butcher processing fees are also discounted from normal retail fees by the approved butchers. Everyone who is a part of HHH helps through their donations, volunteerism and generosity. Donations to Hunters Helping the Hungry, Inc. can be mailed to HHH, P.O. Box 587, Lebanon, New Jersey 08833 or through Paypal. DONATE ONLINE VIA PAYPAL! Think about supporting HHH through savings on your energy bill! The NJDEP Division of Fish and Wildlife would like to inform the public of an effort by the Phillipsburg High School FFA Chapter to receive a grant which will benefit the state Hunters Helping the Hungry (HHH) program. The goal of the chapter is to use the grant money to improve their butchering facilities for HHH and to begin raising and processing livestock to give to the local food bank. FFA Chapter President Brittney Smith nominated the school’s Agriculture Program for a $50,000 or $20,000 grant from the Clorox Grants for Schools program. Online voting by the public will determine the winner of the grant. Earlier this week the grant proposal was in 5th place overall out of 1482 schools. However, the proposal was in FIRST PLACE in the “LEARN” category. A win would mean $20,000 for the FFA program. Voting is conducted daily now through November 1st. Those interested can vote (once each day is allowed) by following the directions below: Go to: http://www.powerabrightfuture.com/ Login: On the top right of the home screen, enter your email address. Information: When you first register, you need to enter your name and birth date (Must be 18 or older for your vote to count!) This only needs to be completed once. Visit the Nominee Gallery: Click on this tab on the right side of the screen after logging in. Search: In the search box type in ‘Phillipsburg FFA Chapter’. Vote: After completing the search, the Phillipsburg Chapter will appear. Click on the photo and click VOTE. Remember: You can Vote Once a Day from October 5th Until November 1st! 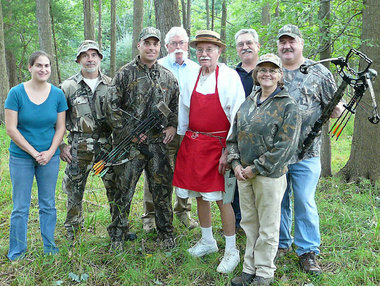 Published: Monday, July 26, 2010, 5:05 PM Updated: Monday, July 26, 2010, 5:08 PM Hunterdon County Democrat Hunterdon County Democrat Hunters Helping the Hungry has received a $2,500 grant from the NRA Foundation to assist with the cost of butchering donated venison that will be given to New Jersey food banks. According to Les Giese of Clinton Township, co-founder of Hunters Helping the Hungry, “This grant allows us to continue providing thousands of pounds of high protein venison to New Jersey’s hungry families.” Since the Hunters Helping the Hungry program began, it has donated over 234,000 pounds of venison, providing approximately 936,000 servings to feed hungry people in the community.